The berries are edible, and rich in vitamin C, though with a very sharp flavour; the thorny shrubs make harvesting them difficult, so in most places they are not widely consumed. They are an important food for many small birds, which disperse the seeds in their droppings. A large annual plant, native to the Himalaya. It typically grows to 1 to 2 m high, with a soft green or red-tinged stem, and lanceolate leaves 5–23 cm long. The crushed foliage has a strong musty smell. The flowers are pink, with a hooded shape, 3–4 cm tall and 2 cm broad; the flower shape has been compared to a policeman's helmet, giving rise to the alternative common name "policeman's helmet". After flowering between June and October, the plant forms seed pods 2–3 cm long and 8 mm broad, which explode when disturbed, scattering the seeds up to 7 m. Impatiens, meaning "impatient", refers to this method of dispersal. 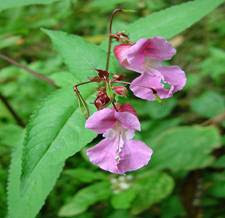 Himalayan Balsam is sometimes cultivated for its flowers. It is now widely established in other parts of the world (such as the British Isles and the United States), in some cases becoming an invasive weed. is a plant native to central and southern Europe, from Portugal and France north to the Netherlands It is a trailing subshrub, spreading along the ground and rooting along the stems to form large clonal colonies and occasionally scrambling up to 40 cm high but never twining or climbing. The leaves are evergreen, opposite, 2-4.5 cm long and 1-2.5 cm broad, glossy dark green with a leathery texture and an entire margin. The flowers are solitary in the leaf axils and are produced mainly from early spring to mid summer but with a few flowers still produced into the autumn; they are violet-purple (pale purple or white in some cultivated selections), 2-3 cm diameter, with a five-lobed corolla. 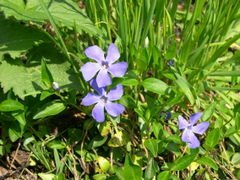 The dried leaves, aerial parts, and in some cases the entire plant of Vinca, are used to enhance blood circulation, including that of the brain, enhance metabolism in the brain, and to treat cardiovascular disorders. fixing atmospheric nitrogen for metabolic use. The body (thallus) of most lichens is quite different from that of either the fungus or alga growing separately, and may strikingly resemble simple plants in form and growth. The fungus surrounds the algal cells, often enclosing them within complex fungal tissues unique to lichen associations; however, the algal cells are never enclosed inside the fungal cells themselves.